I have been working on a new doily this week, and it did not go as I had planned. It is supposed to be an Autumn/Thanksgiving themed doily, and I thought it would be pretty to incorporate rounds of little Autumn leaves worked in different colors. But I just couldn't seem to get the leaves to look right. After several failed attempts, I tried working groups of 3 tr clusters together. I thought the result was pretty, but it really looked more like a bird foot or track than a leaf to me. "It looks like a turkey foot," I thought. And the more I thought about it, the more the idea grew on me; why not have rounds of turkey tracks instead of leaves? That is certainly a Thanksgiving theme! So, the name of the doily was changed to "Turkey Tracks." I should have the pattern ready for you next week. 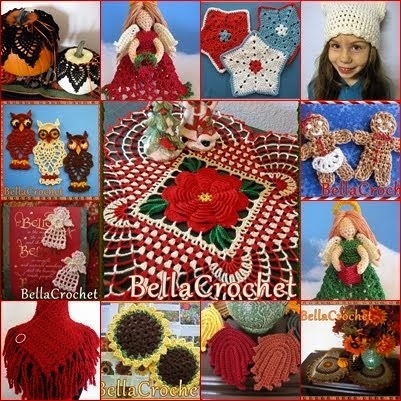 Do you have a crochet project going right now? Thanks for holding these contests! I am working on a sweater for myself. Yes, I am crocheting Christmas tree-shaped ornaments using size 10 thread. They will be different colors (yes, I know Christmas trees do not normally come in pink, but...) for the grands. They will be package trims that can be ornaments next year. Every year I make them ornaments. They must have quite a collection by now! Yes, I always have a project going. I am making a Santa backpack. Fun,Fun,Fun! Thanks for the opportunity to win a lovely pattern from your site. Thank you. I've always have something on my hook. Right now I have a doily and I'm putting squares together for senior lapghans. I love crocheting! My current crochet projects are boot cuffs, hats, and scarves. I would like to make some new doilies and a table runner this winter too. Happy Holidays to you, Susan N.
I always have projects going; right now I am working on Christmas Doilies. As usual I have several going at once! I keep one by my recliner, one by my bed, & usually a couple more that I got bogged down in (or were for myself & were pushed to the side to work on projects for other people!). One can never have enough yarn, patterns, or projects! Hi! Kenzie's gramma here. I am working on crocheted AG doll clothes. I have too many to count and a white board list of what needs to be done... Unfortunately, my whiteboard has been rubbed against too many times and I can't read half of it! I am crocheting a toy bunny and a toy giraffe as Christmas presents! Very cute! Hi - your doily looks nice. would say looks simple campare to your other doilies. Love them all. I am working on a flower doily.